Collection of Uniforms, Coats & Badges -2nd Edition –A new updated edition of the Collection of Uniforms, Coats and Badges has now been printed. This pictures some of the Company’s Collection of Uniforms. Coats and Badges over the years. This original print run sold out and copies of the new edition are now available from Watermen’s Hall. The cost is £10.00 plus postage and packaging of £2.25. 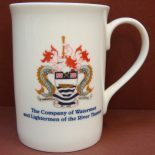 To order your copy please click here or contact Watermen’s Hall on 0207 283 2373.
would make an ideal gift for Christmas or a special birthday and by buying one you are also supporting the Watermen’s Hall Preservation Trust. Please note that postage and packaging is in addition to the above. Doggett’s Blazer – available to any competitor who has completed the course. 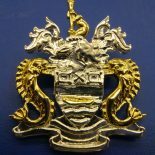 Designed by Rowing Blazers of New York, each blazer will be bespoke at a cost of £250 plus £32.50 for the hand made pocket badge. Those interested should contact Joe Guppy on phone 07791 945988. Please do NOT contact the Hall.